Screen grab of a video posted to Facebook of an ariel view of a Philadelphia car that was riddled with bullets in a running gun battle between a gunman on a bicycle and pursuing police on Thursday morning. Image courtesy of ABC-TV / Facebook. 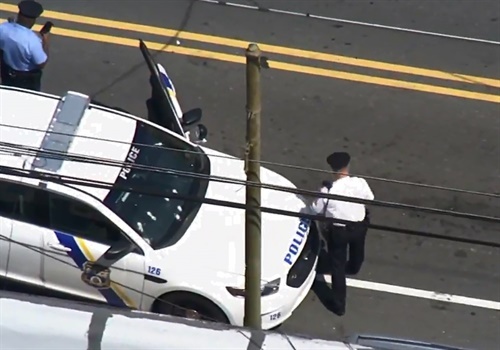 A Philadelphia car was riddled with bullets — and a suspect shot dead — in a running gun battle between a gunman on a bicycle and pursuing police on Thursday morning. Officers approached the 48-year-old man — who has not yet been identified — because they suspected seeing a firearm on him. Philadelphia police say the man then ditched the bicycle and fled on foot while tucking the gun under his shirt, according to the Philadelphia Tribune. Police spokesman Sekou Kinebrew told WCAU-TV that the gunman fired at the officers in that vehicle and they fired back out through the windshield. "We’re trying to determine now if the bullet holes you see in the windshield are from him firing at us, the police, or the police firing back at him," Kinebrew said.